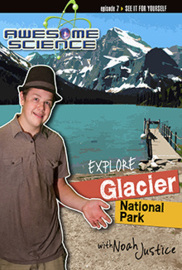 In this episode, Noah travels to northwestern Montana to explore the amazing sites and geology at Glacier National Park. He researches evidence for this area being created and eroded quickly by the effects of the global Flood. He'll share why the Flood provided the right mechanisms to cause the Ice Age and how the end of the Ice Age provides the right conditions for the massive extinctions of mammals like the woolly mammoths. Download ALL TEN Awesome Science Episodes!